Jabir Ibn Haiyan, known in Europe by the name Geber, is generally known as the Father of Chemistry. He was one of the leading scientists in Kufa (in present day Iraq) around 776 C.E. In his early days, he was supported by the advisor to the Abbasid Caliph. Jabir died in Kufa in 803 C.E. Jabir's (Geber's) major contribution was in the field of Chemistry. He is famous for writing twenty-two books on chemistry and alchemy. He introduced experimental investigation into alchemy which led to modern Chemistry. Jabir emphasized experimentation and development of methods to show the same result when an experiment was repeated. He developed basic chemical methods and the study of various chemical reactions and thus helped develop chemistry as a science and away from the legends and "magic" of alchemy. To learn more about him, read Dr. Zahoor's biography. 1. Why was Astronomy important to Muslims? Muslims follow the Lunar, or "moon" Calendar as required by the Qur'an. Months change according to the phases (changes in time) and position [place, location in the sky] of the moon. Each month begins with the first sighting of the crescent moon. This is especially important in the Muslim holy month of Ramadan when fasting is during the day for one month. Astronomy also led to developments in trigonometry, a field of mathematics important to the mapping of the earth and to the computation of planetary orbits. GIF animation by Ed Stephan, wwu.edu showing the phases of the moon. This image is from Michael Olmert, Smithsonian Book of Books, 1992. The original source of the eclipse diagram is the Parliament Library in Teheran. Al-Farghani was one of the most distinguished astronomers in the the House of Wisdom. He wrote "Elements of Astronomy" , a book on celestial (heavenly) motion and science of the stars. It was translated into Latin in the 12th century and exerted great influence upon European astronomy. It supported the widely held view that the earth was the center of a system around which went the planets and the sun (first described by Ptolemy, a Greek astronomer who lived in Alexandria, Egypt). 'Abd al-Rahman al-Sufi was a Persian astronomer who lived during the 10th century. In 964, he described the Andromeda galaxy, our closest neighbor, and called it "little cloud". This was the first record of a star system outside our own galaxy. Al-Sufi's book on stars was translated into many languages and had a big influence on European astronomy. In Muslim Spain, there were many famous astronomers. Al-Zarqali (known as Arzachel in Europe) lived from about 1029 to 1080. He was the most famous astronomer of his age. He made a kind of astrolabe that measured the motion of the stars. His work was translated into Latin and other languages and his books were studied later in Europe. Al-Bitruji developed a new theory of stellar (star) movement. He was born in Morocco. He later migrated (moved) to Spain and lived in Seville. He died at the beginning of the thirteenth century around 1204 C.E. Above is a Turkish miniature painting showing astronomers and their tools (from Topkapi Palace Museum: "Taqi al-Din b. Maruf and his colleagues at the Istanbul observatory" from Lokman, Shahanshahnama, or "Book of the King of Kings"), Istanbul, 1581-1582). Click on the picture above to see two large images of the original. 3. Observatories (places to look at the night sky and study the stars) were first established in the Islamic world in major cities such as Baghdad, Hamadan, Toledo, Maragha, Samarkand, and Istanbul, and new instruments were developed. The Muslim invention of the astrolabe, for example, was one of the most important in astronomy until the invention of the telescope in the 17th century. Muslims were also the first astronomers to challenge the long-accepted theories of Ptolemy and Aristotle regarding eclipses, planetary orbits, and the position of the stars. 4. Tools of Astronomy: Muslims further developed the earliest astrolabe, a great astronomical tool. (They improved upon the Greek invention.) It was used to determine one's latitude (or place on the earth) by looking at the position of the stars and sun. It was especially important to travelers. The astrolabe (an instrument used for measuring the positions on the earth). For a student project "Building an Astrolabe" and one from Singapore's Virtual Science Center - "Building an Astrolabe". Photo: Muslim scientists developed the astrolabe, an instrument used long before the invention of the sextant to observe the position of celestial (heavenly) bodies. Read an excellent article on Islamic Astronomy which tells how Muslim scientists translated Greek and Indian works, and improved upon them. This site also has a good description of the astrolabe and how it was used as a measuring device and as a "calculator". 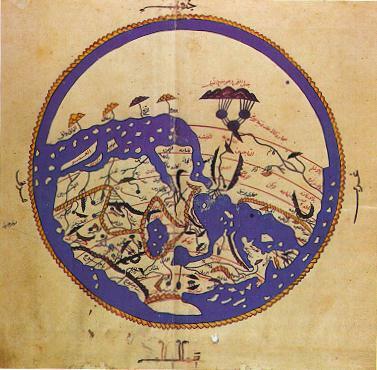 This map below is by Al-Idrisi. It is shown both as he drew it (north to the bottom) and "upside down" (north to the top, as we are more used to seeing maps). Can you make out the land and sea features - that's the Mediterranean Sea and the Red Sea in the middle. Muslims traveled widely during the Middle Ages. They traveled on the hajj to Mecca, and on vast caravans for trade across Africa, the Middle East, and Asia. Al-Idrisi is best known in the West as a geographer, who made a globe or sphere of silver weighing 400 kilograms for the Christian King Roger II of Sicily. Some scholars regard him as the greatest geographer and cartographer (mapmaker) of the Middle Ages. He put together a geographical encyclopedia with many maps. See another short biography of Al-Idrisi . 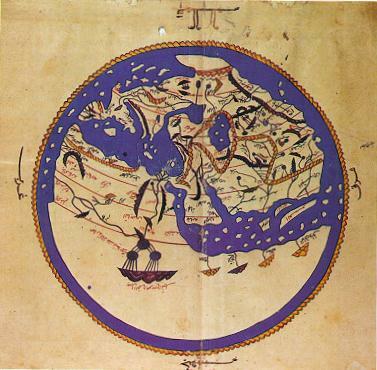 A copy of the map of Al-Idrisi is displayed in the Sharjah Islamic Museum in the United Arab Emirates. 2. Leo Africanus (Hasan a-Wazan) was a traveler and map-maker who lived from 1485-1554. He was captured by Christian pirates and presented to the Pope as a slave. He later was commissioned to write about and make maps of his travels in West Africa. His description of Timbuktu (now in the country of Mali) tells of the city famous for trade of African products and for scholarship with a thriving trade in books. (From "Leo Africanus: Description of Timbuktu" Washington State University.) Read another biography of "Leo Africanus: Moorish Man of Learning." For more information on geography and travelers, see our own webpage: Travelers and Map-Makers. Al-Biruni made original and important contributions to science. He discovered seven different ways of finding the direction of the north and south, and discovered mathematical techniques to determine exactly the beginnings of the season. He also wrote about the sun and its movements and the eclipse. In addition, he invented a few astronomical instruments. Many centuries before the rest of the world, Al-Biruni discussed that the earth rotated on its axis and made accurate calculations of latitude and longitude. 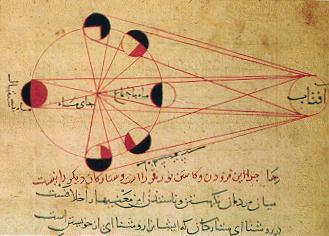 Al-Biruni was the first to conduct elaborate experiments related to astronomical phenomena. He stated that the speed of light is immense as compared with the speed of sound. He described the Milky Way as a collection of countless fragments of the nature of nebulous stars. When the Sultan sent him three camel-loads of silver coins in appreciation of his encyclopedic work, Al-Biruni politely returned the royal gift saying, "I serve knowledge for the sake of knowledge and not for money." Al-Biruni is considered to be one of the greatest scientists of all times. Go to Page Three: Islamic Sciences: Medicine, Botany, Optics. Go to Page Four: Islamic Sciences: Why did the "Golden Age" end?